Tracktion 6 adds more than enough new stuff to justify the upgrade price, and remains a bargain for anyone looking for a powerful, intuitive cross-platform DAW. Great value. Many deep features. Improved audio manipulation. Integrated Melodyne. Essential Responsive interface. Not pretty. Its workflow won't appeal to everyone. Since Tracktion's acquisition from Loud Technologies by its development team a couple of years ago, the updates have been coming thick and fast, and just over a year after the release of v5, Tracktion 6 (for Mac OS X, Windows and Linux) is upon us. In fact, it's actually version 6.1 that we're looking at here, the subsequent x.1 addendum introducing a major new feature in the shape of Warp Time. Tracktion 5 http://www.musicradar.com/reviews/tech/tracktion-software-corporation-tracktion-5-599366 was a significant release that focused on editing improvements and CPU management. "It's an incredibly powerful DAW for the money, and although it has its own way of doing things, it's very easy to get to grips with"
Headline additions were Edit Clips (enabling you to save on CPU cycles by working with fully rendered sessions), Freeze Point plugins (freeze a track up to any point in the processing chain) and per-note MIDI automation. After our review, Tracktion 5 also gained Marketplace integration, providing integrated access to Tracktion's own online plugins store, and Melodyne Essential as a bundled freebie, fully integrated into the architecture of the DAW itself. Version 6.1 builds on these features and continues to reinforce the 'modeless' operational concept that's always been fundamental to Tracktion: everything visible in a single main window with signal flow from left to right (including the mixer), and no separate pages with their own tool sets to worry about. This workspace has no fixed structure as such, with track types based on their content (MIDI or audio) and routings (inputs, auxiliaries, etc) created on an 'as needed' basis. While all this might make it seem like Tracktion puts simplicity at the top of the agenda, the DAW certainly isn't short on features, with plenty of contextual right-click functions, and numerous settings accessed via the submenus in the bottom left-hand corner. The middle bottom panel switches to display the parameters for whatever you currently have selected elsewhere, including Track settings, Clip settings and, of course, the controls for Tracktion's built-in effects. Visually, Tracktion 6 looks the same as version 5, we're both happy and sad to report. While the GUI is wonderfully responsive (resizing panels is notably quick, for example) and doesn't feel weighed down by graphical bloat, it's not exactly what you would call 'a looker'. As you would expect, Tracktion 6.1 introduces a number of new features, as well as improvements to several existing ones. In the former category, Warp Time is a new transient marker-based system for adjusting the timing of audio clips; while at the top of the improvements list is the upgrading of the Z-Plane Elastique timestretch engine to the latest Elastique Pro. This also sets the stage for another new feature, whereby audio fades in and out can be set to speed up or slow down for tape machine- style effects. On the recording front, Tracktion 6 generates waveforms during recording in real time, and you can drop out of and back into record on the fly simply by clicking the red 'R' icon on the Track. Related to that, Tracktion Software Corporation have also extended their take on swipe comping: in addition to comping of nested cycle takes on a single track, you can also now create a Comp Group, assigning any Tracks you like to it and swiping to achieve mutually exclusive playback from said tracks. 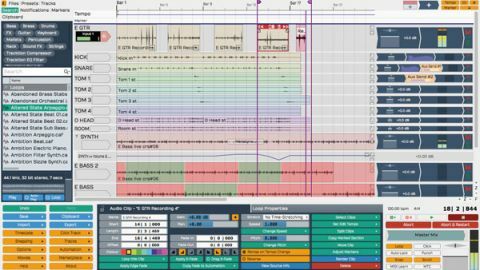 Tracktion 6 adds foldaway automation lanes below each track, too. You can add as many as you like and freely assign plugin parameters to them, then fold them away. There's also a new 'Remap on tempo change' option, available locally or globally, that ensures automation retains its relative rather than absolute position when you make tempo changes. The left-pane browser has been reworked with a new unified Search panel, and now boasts improved tagging. As well as right-clicking any preset or audio file to open its Tag dialog, tracks can now be tagged via the main Track parameters at the bottom of the workspace, enabling the visibility of tracks in the main workspace to be filtered by tags. On the effects front, Tracktion 6 includes a sidechain input option for its built-in compressor and plugin Racks (multi-plugin containers, like Ableton Live's equivalent of the same name). The new Insert plugin, meanwhile, hooks into your audio interface to provide a hardware insert point in Tracktion's mixer. Finally, Clip editing functionality has been extended in a number of ways. Worthy of mention are the addition of a Velocity/Gate (VG) lane to Step Clips, which allows independent velocity control and note gating (via the velocity bar height and width, respectively) for Tracktion's drum editor-style MIDI Clips. Step Clips now also have independent instrument destinations for each Step Clip channel. Any evaluation of Tracktion 6 has to take its low price into consideration, of course. It's an incredibly powerful DAW for the money, and although it has its own way of doing things, it's very easy to get to grips with. And even when it isn't, the excellent pop-up help often saves the day, although we would like to see the addition of a full manual to help with its more intricate functions and systems. Other than that - as shallow as it may sound - our main request would be for a graphical redesign to at least make it look more contemporary. Nevertheless, Tracktion 6 is a fantastic DAW at a price that can't be argued with.